After months of visiting museums, galleries, and (more specifically) their lovely cafés, something needed to be done. It was time to find an activity that involved actual physical activity. For me, exercise works best when you trick yourself into doing it as you’re having fun. 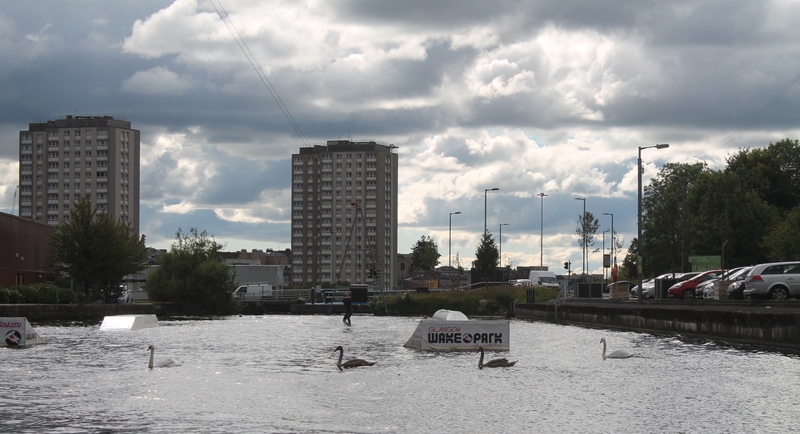 I’d heard about Glasgow Wake Park but hadn’t realised just how accessible it was – you can even get the subway – so one sunny day it seemed wise to at least give it a go. My limited exposure to board sports mainly consists of an ill-fated snowboarding attempt 5 years ago. An afternoon of falling and taking out unassuming skiers on the baby slope (still feeling guilty about that) resulted in a decision to avoid boards at all costs, if not for the sake of my elbows and knees, then for the safety of all those within 100m of my balancing skills. 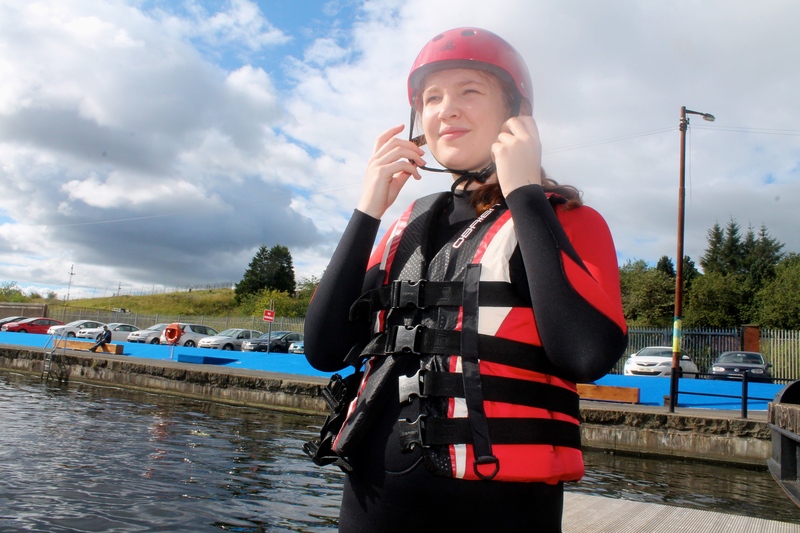 Given that you wakeboard one at a time, I crossed my fingers that I would manage to avoid a minor disaster and tried to look casual and confident in my wetsuit and helmet. The Wake Park consists of a section of canal with jumps and ramps and things to avoid at all costs – until you know what you’re doing, of course. You hold the handle, and it’s almost like a zip wire, pulling you along and mimicking the wake of a boat. Boatless wakeboarding. Fairly simple in theory. 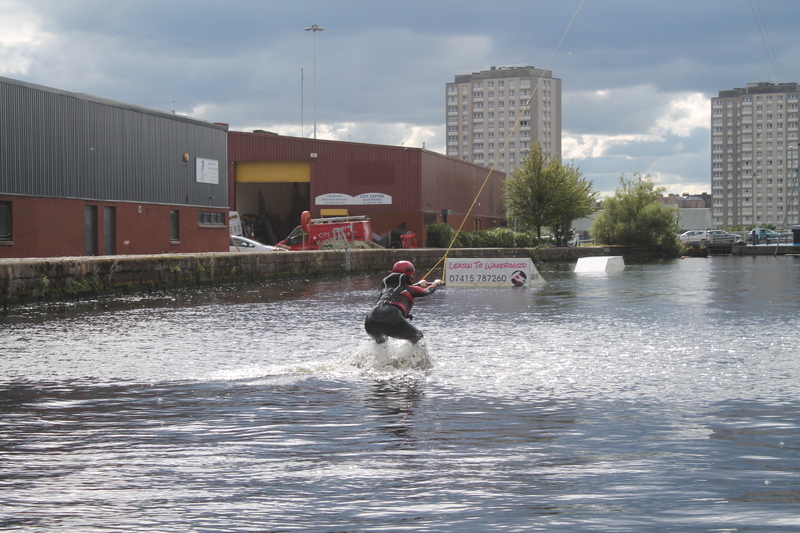 Wakeboarding: As demonstrated by the captain of the Glasgow Uni Wakeboarding Club. Despite a demonstration, I started off with a less than ideal body position which resulted in faceplanting a lot. It was pretty funny though, so I suppose I’d better share the photo evidence anyway. After several faceplants I was pretty nifty at turning myself around in the water with a board strapped to my feet, which may turn into a handy life skill, who knows? It was also starting to feel like the longest and most tiring 15 minutes of my life. The instructor was very patient and continued thinking of different ways of explaining the ultimate wakeboarding position to get me moving. When, suddenly, it happened. And it was great fun. 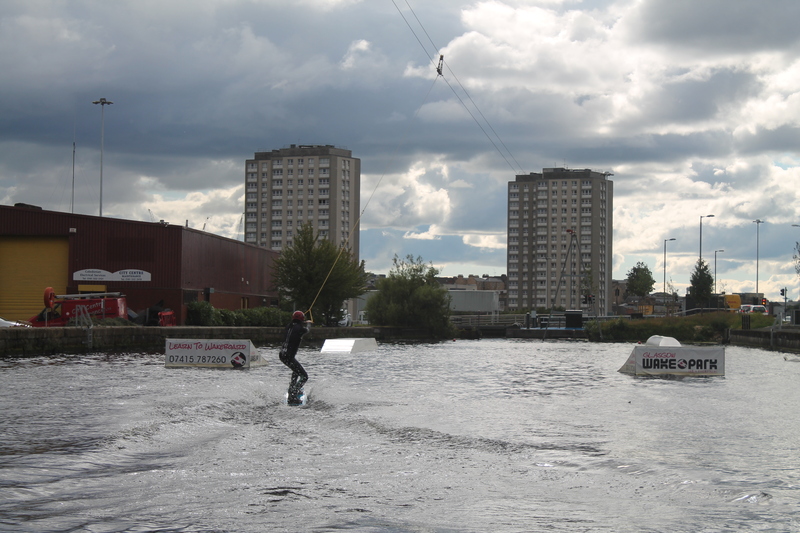 It might not have been perfect, but it was definitely wakeboarding of sorts. 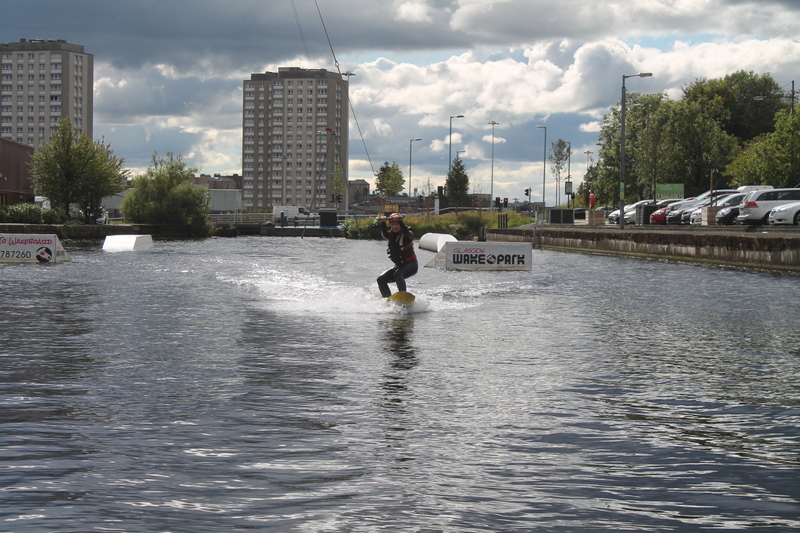 I’m hoping to practice a bit more and maybe one day wakeboard on a REAL LOCH. They probably have even more challenging wildlife than the local canal swans, too, which served as great motivation to learn how to change direction, fast. 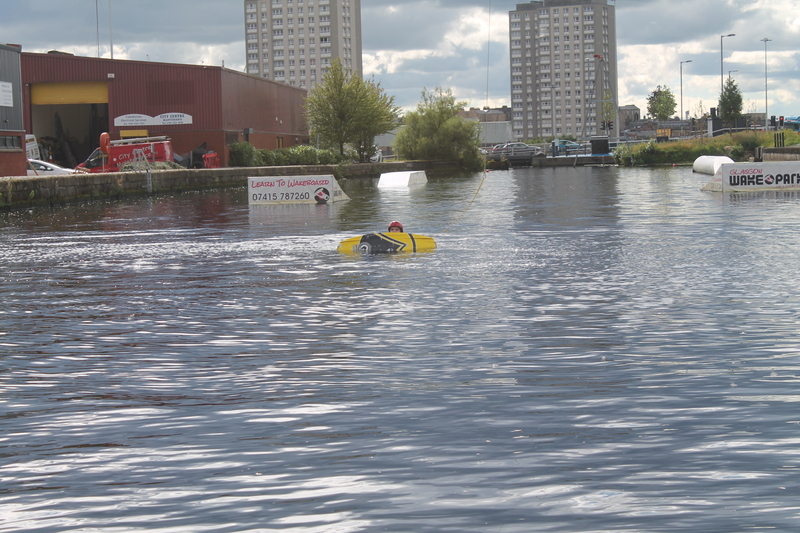 With Loch Lomond just down the road and the Wakepark a subway ride away, it would seem that Scotland’s fastest growing new watersport is also one of the most accessible. And let’s be honest, it would be a pretty amusing first Tinder date, too. What are you waiting for? 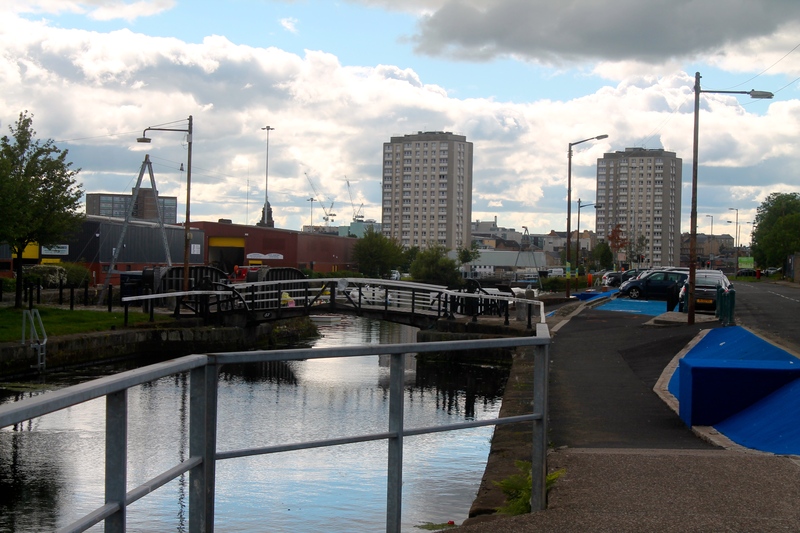 Glasgow University students can click here for more info on the club, otherwise check out the Park’s Facebook page. If you’re more of a ‘try before you buy’ type, head along to the Grassroots competition at Glasgow Wake Park on Saturday and watch some seasoned pros at work to get inspired.